While most visitors to Melaka’s historic Bandar Hilir will opt to stay in one of the many hotels within the heritage zone, one of the city’s latest openings is about one kilometre away from major attractions; but don’t let that put you off as it’s very easy to get around. If you’re looking for a stylish and affordable weekend getaway, Rosa Malacca’s smart spacious rooms, well-thought out amenities and friendly service tick all the boxes. Both pretty and practical, the 60-room boutique hotel is an Instagrammer’s dream of red brick, polished concrete surfaces and industrial chic interiors softened with countless cushions and mood lighting. This is most evident in the reception area, which is on the first floor. The same approach has been extended to the guest rooms, which are built around an inner courtyard – bringing the outside in, so to speak. If you come with family or friends, the hotel’s Family Suite and Premier Family Suite (connecting King and Twin rooms) are ideal for those who need more beds and bathrooms. As a solo traveller, I stayed in a spacious Premier King room overlooking the corrugated rooftops of the town. The four-poster bed is the focal point of the room, and although I found the mattress a little hard, I did get a good night’s rest. The bathroom is similarly large and well stocked. A buffet breakfast is served in the Courtyard from 7.30am. It includes tea, coffee, freshly squeezed juices, a generous selection of cereals and a rotation of hot dishes. On the morning I was there this included nasi lemak bungkus, boiled and (perfectly) scrambled eggs, baked beans, hash browns, waffles, pancakes, and breads and pastries. For all day dining, Bica & Co, the hotel’s restaurant has a small, globally minded menu with some enticing vegetarian options. 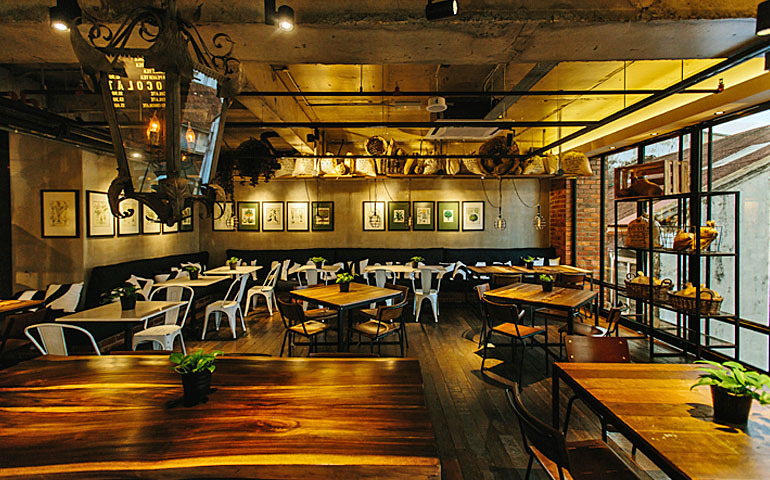 Smartly, the restaurant has chosen not to compete with Melaka’s excellent street food, although there are concessions to local favourites like the Seared Salmon Laksa, the Chicken Wing Laksa and Asian Glazed Chicken Chop. Other facilities include a surau and small gym located on the seventh floor rooftop, on-site parking, and if you somehow forget to buy souvenirs, the RS General Store stocks some witty slogan tees that name check Melakan destinations.